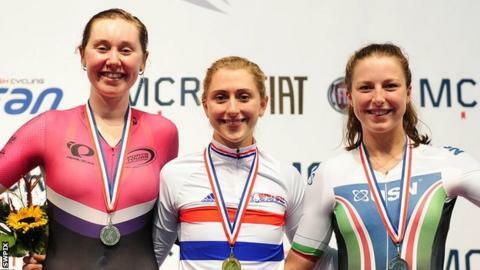 Laura Trott retained the women's scratch title to win her second gold medal at the National Track Championships in Manchester. The double Olympic champion, 23, pipped Katie Archibald in a repeat of Friday's one-two in the individual pursuit. Archibald helped Pearl Izumi to gold in the women's team pursuit, while Katy Marchant won the women's keirin. Jason Kenny (1km time trial), Lewis Oliva (sprint) and Oliver Wood (points) won their respective finals. In the team pursuit, Olympic champion Joanna Rowsell Shand, Ciara Horne and Dame Sarah Storey joined forces with Archibald to secure victory. Elsewhere, double world championSophie Thornhill and her pilot Helen Scott claimed their second gold medal with victory in the Para-cycling BVI 200m time trial. The duo had won the standing-start time trial on Friday. Defending champions Lora Turnham and Corrine Hall retained their mixed BVI pursuit title, while Jon Gildea did likewise in the mixed C1-5 pursuit. Cambridge sprinter Jody Cundy claimed gold in the C1-C5 200m flying-start time trial. Trott and Scot Archibald were in a class of their own in the women's scratch, twice lapping the field before the English rider powered ahead in the sprint for the line. Three-time Olympic champion Kenny, meanwhile, clocked 62.042 seconds to win his race, with men's keirin winner Matt Crampton second and Steve Burke third. Welshman Oliva went one better than the silver he earned in Friday's keirin with a dominant performance in the men's sprint, beating Bolton's Matt Rotherham. Yorkshire rider Wood scored 66 points to win his race ahead of 2014 champion Mark Stewart (63) and Chris Latham (47). In the final event of the evening, Manchester-based Marchant added to her gold in the individual sprint on Friday with another title in the keirin. She came from the back and held off Becky James, with Jess Varnish taking bronze ahead of Trott. The championships conclude on Sunday with the men's scratch, team pursuit and team sprint, and the women's points and team sprint.